The Eclipse environment solves the problem of having to maintain your own Integrated Development Environment (IDE), which is time consuming and costly. Embedded tools can also be easily integrated into Eclipse. The C/C++CDT is ideal for the embedded community with more than 70% of embedded developers using this language to write embedded code. Eclipse simplifies embedded system development and then eases its integration into larger platforms and frameworks. 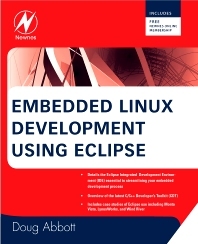 In this book, Doug Abbott examines Eclipse, an IDE, which can be vital in saving money and time in the design and development of an embedded system. Eclipse was created by IBM in 2001 and then became an open-source project in 2004. Since then it has become the de-facto IDE for embedded developers. Virtually all of the major Linux vendors have adopted this platform, including MontVista, LynuxWorks, and Wind River. Doug Abbott is a consultant with over thirty years’ experience, specializing in hardware and software for industrial and scientific data acquisition and embedded product applications. Doug is also a popular instructor and seminar leader, who teaches classes in PC technology and real-time programming for University of California Berkeley Extension. He has taught the techniques of real-time programming and multi-tasking operating systems to hundreds of professional engineers. Doug Abbott is the principal of Intellimetrix, a consulting firm in Silver City, NM, specializing in hardware and software for industrial and scientific data acquisition and embedded product applications. Among his past and pre-sent clients are Agilent Technologies, Tektronix, Sandia National Laboratory and numerous smaller high-tech com-panies in Silicon Valley. Mr. Abbott has over thirty years experience in various aspects of computer hardware and software design and has been an independent consultant for the past fifteen years. Prior to founding Intellimetrix, he managed software de-velopment for DSP Technology, Inc, a leading supplier of high-speed instrumentation. Doug is also a popular instructor and seminar leader, who teaches classes in PC technology and real-time program-ming for University of California Berkeley Extension. He has taught the techniques of real-time programming and multi-tasking operating systems to hundreds of professional engineers. These classes can also be customized and made available for on-site presentation. Mr. Abbott received an MSEE degree from the University of California at Berkeley. Good depth into Project configuration settings.